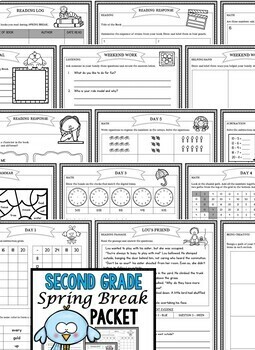 This second grade spring break packet is for students to review math and ELA skills in the week they are on spring vacation! These NO PREP homework worksheets include a week of engaging printables for you to print and send home with your students. In addition, there are two printable weekend activities, a reading log with activity sheets, answer keys and extra printables for even more spring learning! • Please go to your My Purchases page (you may need to login). Beside each purchase you'll see a Provide Feedback button. Simply click it and you will be taken to a page where you can give a quick rating and leave a short comment for the product. I appreciate your feedback and the time it takes you to do so! • Look for the green star near the top of any page within my store and click it to become a follower. You will then receive customized email updates about this store.